Our team absolutely loves when new cartridges are introduced! We pride ourselves with not only offering these new rounds, but also providing as much compiled testing data to help answer as many questions for curious customers as possible. This information enables our clientele to not only obtain these innovative rounds, but have the security of knowing how they’ll perform, and where to start with hand-loading. The new 6.5mm PRC is the most impressive 6.5mm caliber chambering that we offer that has hunting and match ammo available for purchase. Let’s jump into the data to see what we found in the early stages of our testing. 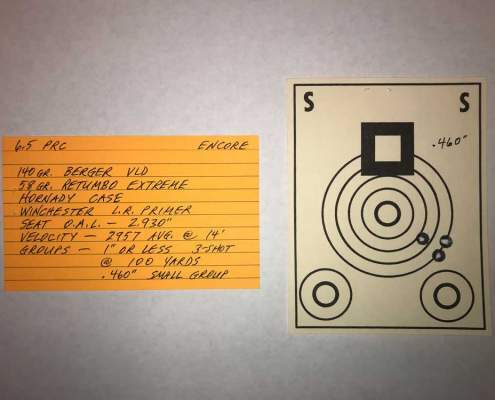 Since Hornady is yet to offer the SAAMI PSI rating for the cartridge itself, and the specific loads they are selling, we’ve been in quite the predicament as to whether or not we can offer this round in the Encore platform at all. To overcome this fact, we built a sacrificial prototype barrel in order to conduct a stress test on the brass/receiver. Initially our thought was to determine a maximum load judging on how the spent cases and primers appeared after firing. 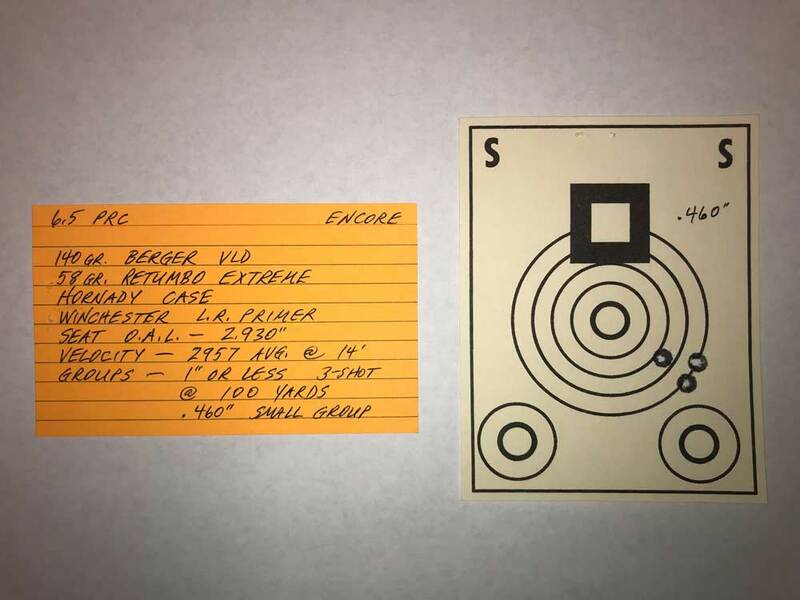 After we had the powder charge established, we could base a good set point for approachable loads to take to the range, and get velocities and accuracy data. 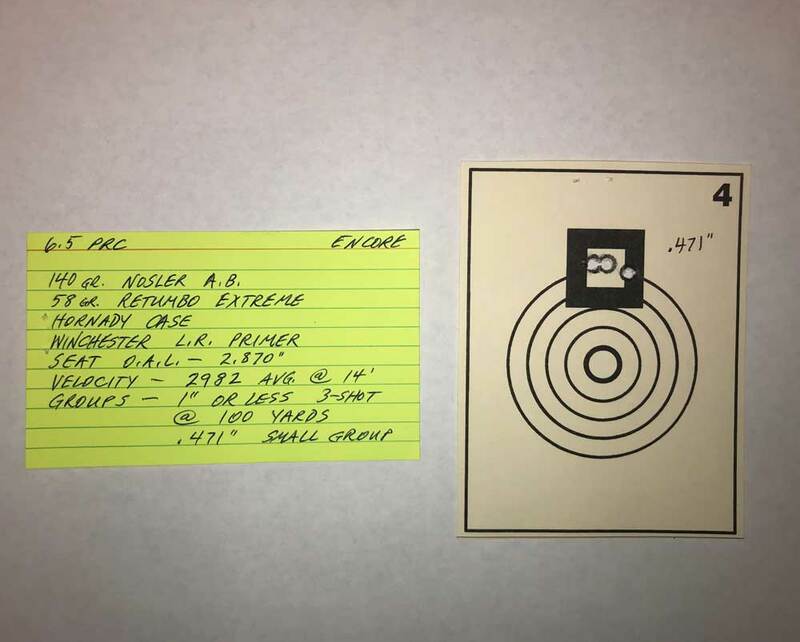 However, prior to taking the setup to the range we decided to brutally test two pieces of brass to gauge the amount of resizes they could handle. 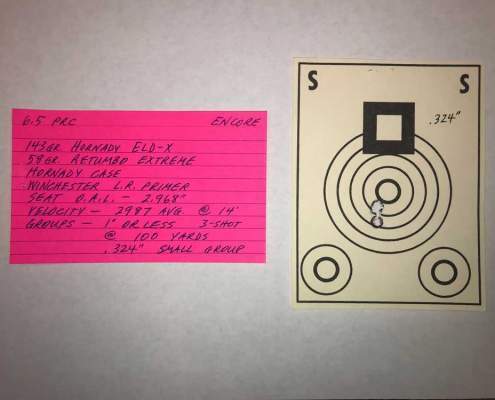 After settling at 58 grains of Retumbo, topped with the 143 ELD-X, we loaded and fired the brass 11 times without annealing; which yielded only signs of very hardened brass but no excessive wear or visible “splitting rings”. After several trimmings and the barrel getting too warm to touch, we decided to step it up to 61 grains of H1000 to end the suffering! Two firings of that recipe resulted with a split case at 1.190″ from the base, as shown in the picture. Typically magnum size cartridges yield shorter brass life, like with the 264 Winchester Magnum and 7mm Remington Magnum, but this case geometry and lack of belt prove to break-the-mold with ultra efficient and economical results. 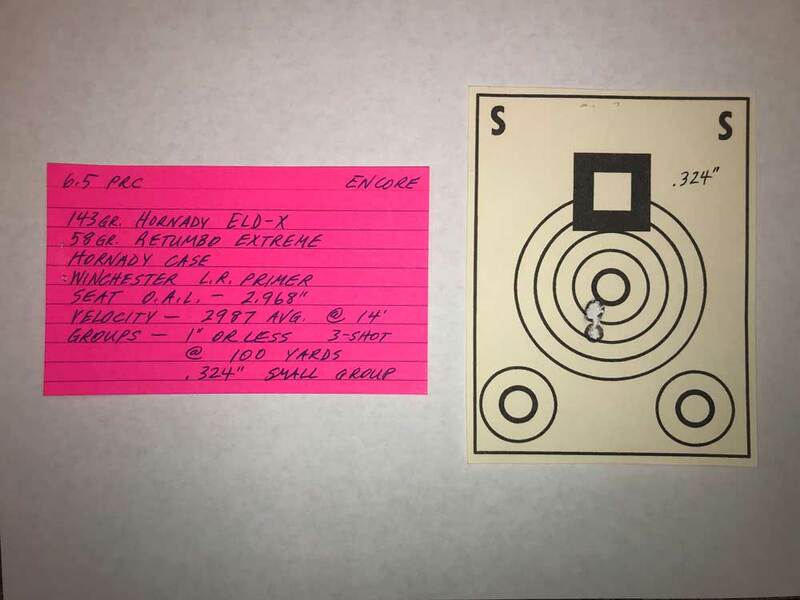 Assuming barrel life similar to a 6.5mmx284 bolt action rifle, (since this is a single shot Encore we’re talking about), with our given testing results, and doing simple math shows that 100 properly maintained brass will last as long the barrel! All testing performed with a 24″ heavy factory contour barrel. We easily achieved factory velocities with hand-loads, a fear rumored to be unobtainable by some. We also proved that brass life will not be any kind of issue with our ridiculous stress test we performed. Annealing the cases like responsible hand-loaders should will provide even longer brass life than we encountered. While working up the loads we discovered that the cases will simply run out of room for a bullet before reaching a point too dangerous for the Encore platform when suitable powders are being loaded. These enlightening facts allow us to offer this round on the Encore platform without the SAAMI pressure information from Hornady. DISCLAIMER: The information above is for informational purposes only and is provided only to help you determine which barrel best suits you. 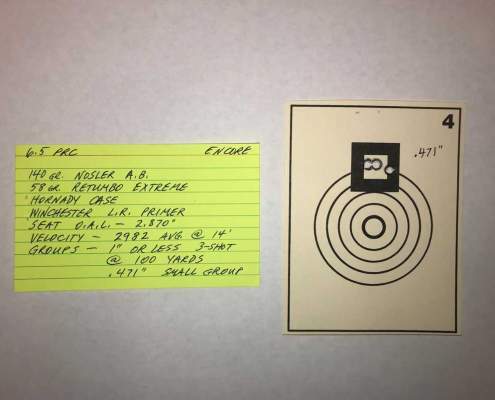 This is not meant to be instructive of the loads you should actually use, and you should not rely on the load information below in loading your own rounds. Hand-loading ammunition can be dangerous if done improperly, and mistakes may result in serious injury or death. Always use a reputable reloading manual to source information on selecting loads for your firearm. Match Grade Machine is not responsible for any mishap caused by negligent or otherwise improper hand-loading of cartridges. Be sure to always use the proper equipment, tools, and safety measures when reloading, shooting, transporting, and cleaning your firearms. Know your firearm’s capabilities and operation procedures before use.